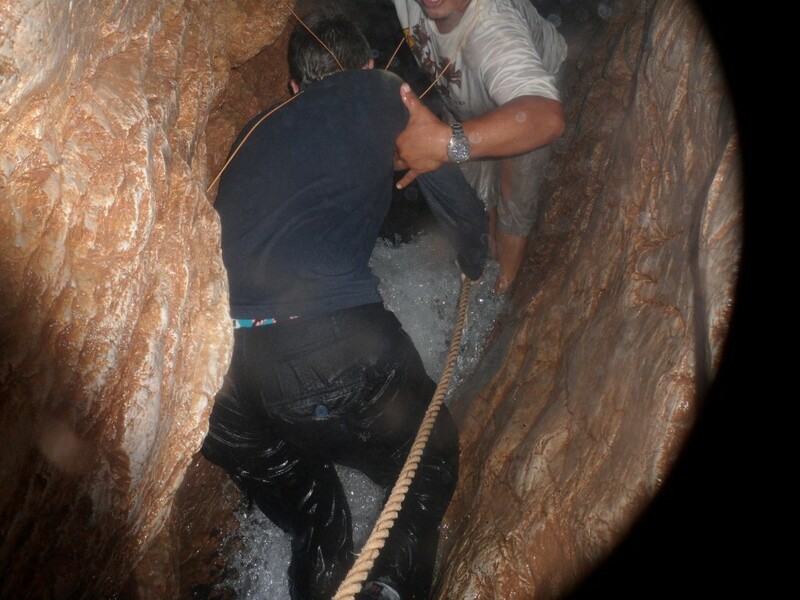 11-14 Khao Sok to Khao Lak – Do your dream! 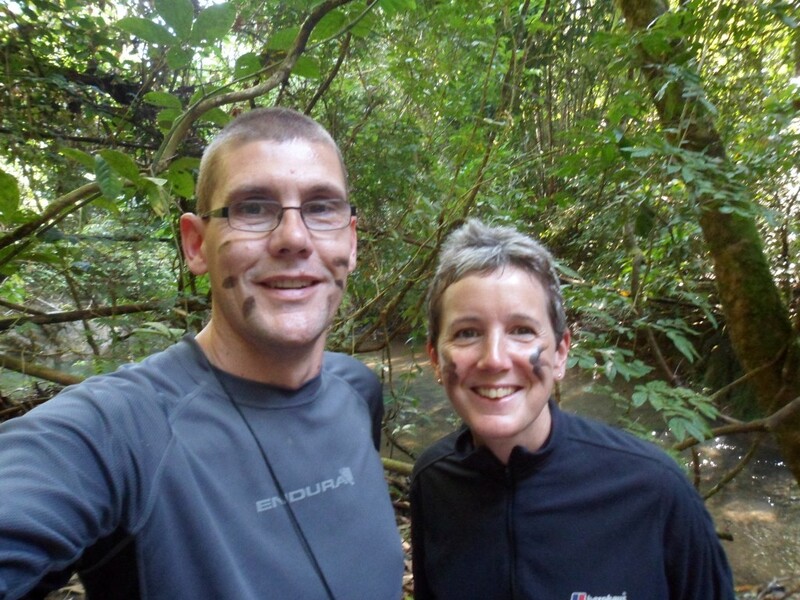 After chatting to the owners of our lodgings, we did decide to go on an organised 2-day excursion into the rain forest, long-tail boat, canoeing, bit of a cave hike, and the night on (literally) the lake in the middle. Tourist tacky perhaps, but should be one of those unique experiences (like camel trekking overnight in the Sahara) that you just have to do – and it will take us further into the forest than we’d venture ourselves. In the end, the excursion turned out to be pretty good and amazing value. The views around the lake were stunning, and our lake houses were set in a beautiful little cove. The huts themselves were pretty good (considering) – and the central area and inclusive meals were really very good indeed. Kayaking and swimming were the norm with the lake being clear and very warm. Due to it almost being full moon (and thus very bright), the evening and night animal hunts turned up only a monkey or two and a wild pig, though the jungle sounds and gibbon calls could be heard most of the time. After breakfast and a morning dip, we ventured on about a 4 hour jungle hike into some caves, but the caves were rather wet with us having to wade/swim through streams and in caverns with water at neck height, and also scramble up a mini waterfall in the cave. Very interesting with frogs, bats and spiders, and of course lots of dark tunnels and getting absolutely soaked. Our guide (the owner of Smiles where we were staying) was good fun and very knowledgeable. On the way back a bit of cliff jumping (as high as you wanted, which wasn’t that high for me!) – then back to base thoroughly knackered but good fun. 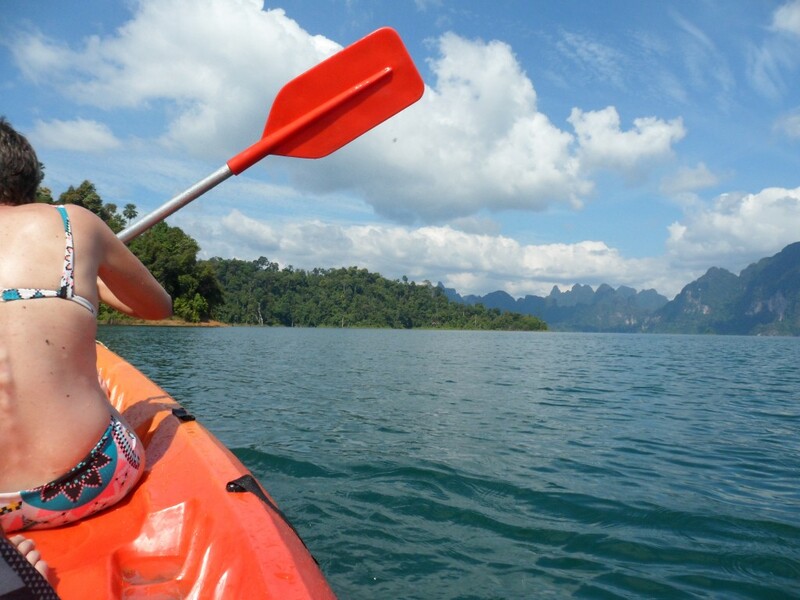 A must if you come to Khao Sok, and (as far as we found), Smiles did by far the cheapest excursion (2200 bhat if 8+ people) including meals/transport/water etc. Bargain. The following day we decided to have a chilled day in the hammocks, get the laundry done (by someone else of course), and look at the map. We decided to have New Year in Kuala Lumpur and see New Year in watching the fireworks between the Petronas towers. So we booked some flights from Krabi to Kuala Lumpur with Air Asia (The RyanAir of Asia – baggage extra etc..) and some accommodation in KL as KL looked fairly busy over the new year period. We fly there on 28 December so need to made a rough plan from now till then. 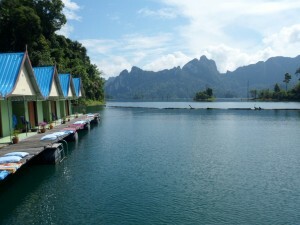 We’ve very much enjoyed the quiet Khao Sok, and Smiley Bungalows – really recommend them if you come here. Our next stop from Khao Sok is Khao Lak, a small town on the coast that was badly affected (4000 dead) in the 2004 Tsunami – our first stop that has just been tipped to us en-route and not one on our plan. After paying our bill we got to the main road to await the hourly bus. 90 mins later one turned up and cost a simple 100 bhat (£2) to get to Khao Lak. Still quite simple, and much needed aircon! At Khao Lak the heat was intense but a quick thunderstorm cleared the air. We both felt a bit unwell (possibly side effects of the anti-malarial drugs) so just chose to chill for the day and drink lots of water ready for the next instalment.